Home > Thought Leaders > Blog > Skills > Payments > How can we reshape retail without reshaping payments? Well, the circus came to town again. Barcelona. It’s 100,000 people and non-stop meetings and basically no fun whatsoever. But it’s in Barcelona. The calendar is jammed from first thing in the morning until the evening, and then it’s out for dinner and drinks with customers and suppliers. Man, that Catalan pasta was delicious. It’s absolutely exhausting. My feet are killing me by coffee time and I’m not in heels. Loved that lemon beer though, never had that before. The communist traitors down the metro are on strike so we have to queue for buses. It’s lovely and sunny here. Eight halls! Still, let’s take a deep breath and get on with it. I’ve been interested in mobile payments for 20 years. A decade ago, Consult Hyperion was lucky enough to be chosen by Vodafone to carry out the feasibility study on M-PESA. I can remember seeing the first Nokia with a contactless chip (Mastercard) embedded in it and being blown away by the convenience. I am the archetype for the stereotype in mobile futurists presentations, the person who often leaves the house with a phone but no wallet. 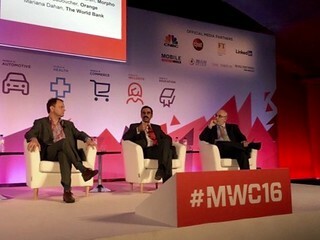 Last year at MWC I gave a presentation about the impending shift to in-app payments. So, you can imagine how downhearted I was to see this vista before me on arriving in the host city. Yep. Twenty years of mobile payments, twenty years of presentations about mobile payments at MWC, twenty years of pilots and trials and tests and MoUs, twenty years of arguing about SIM vs. embedded vs. SE, twenty years of closed-loop and open-loop and three-party and four-party, and there’s a queue a mile long for the ATM because you can’t use your phone to by a metro ticket or ride the bus into town. Where did it all go wrong? Why aren’t there mobile payments everywhere? In a sane world, as we landed in Barcelona our phones would automatically fire up a Barcelona app that we could use to pay for the trains and taxis, restaurants and hotels. How long would it take for your bank to issue a four day, Barcelona merchant-only token to the handset? Five seconds? Why can’t I pay in-app for my hotel? Karen Webster wrote about this too. Karen points to the role of the carriers as a fundamental problem, and she is certainly right to note that their attempts to be toll collectors for the superhighway have been a boat anchor on progress in mobile commerce just as it will be for IoT commerce, but I wonder if there’s something more fundamental going on. What if the attempts to shoehorn the existing infrastructure (of PANs and acquirers and networks and schemes and issuers and authorisation and all the rest of it) are themselves responsible for the drag? What if we should have started again? What if we should have just said that the mobile phone gives us a mechanism to establish (and verify) the identity of everyone and once you know who the counterparts are, payments are easy. What if we should have started with mobile ID instead of taking 60+ year old way of doing a payment? I was lucky enough to be asked to chair the MWC conference session on “Digital Identity for Connected Societies”. During this discussion, it became very clear to me (and, I hope, the rest of the audience) that we already have all of the building blocks that we need to create a strong identity infrastructure based on the mobile phone. If we take that architecture as a given, then what “payments layer” should be put on top of it? You know where my sympathies lie: in the “push to push”. Karen correctly, in my opinion, talks about the reshaping of retailing. Mobile and online – together — is creatively destroying the retail model that’s been in place for millennia – a model that used to rely only on consumers and merchants coming together face-to-face to do business. Why do we think that we can reshape retail without reshaping payments? Here’s just one example: why do you give card details to the merchant? It makes no sense: it’s because you used to hand your card to merchants in shops. Surely it would make more sense to send the _invoice_ to the bank, have the bank pay it and send back the _paid invoice_ to the merchant. Why should the merchant ever seen your card, tokenised or otherwise? Since merchants are installing BLE anyway, why not just transmit the invoice over BLE to your phone and have your phone send it to the bank for payment? I’m just giving a random example, but you see my point. Here’s what’s gone wrong: we took amazing new technologies (smart cards, mobile phones, biometrics) and used them to emulate some cardboard hack from 1949. Time to scrub off the whiteboard and start again. 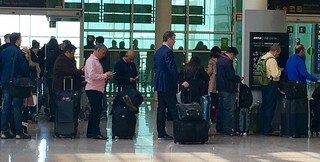 I make this vow here and how: if you cannot use your phone to pay the airport bus in Barcelona at Mobile World Congress 2017, then I will never go again.